The commissioning service was officiated by the Kaneshie Area Head, Apostle Mike Kwame Etrue, assisted by the Nyamekye District Minister, Pastor Joseph Ackah, and the pastorate in the Area. 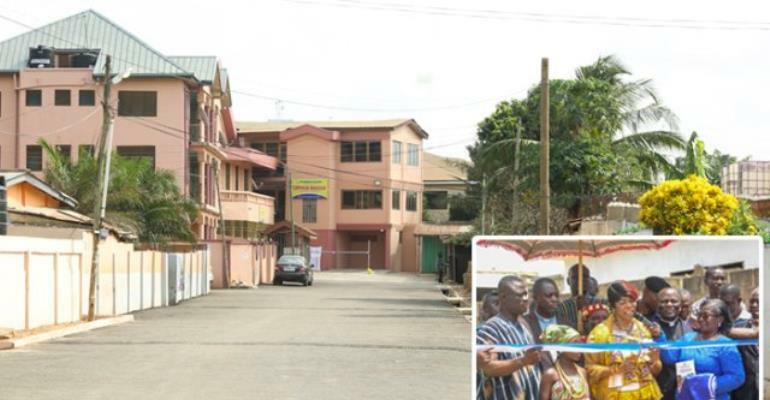 The Nyamekye Central Assembly in the Kaneshie Area of The Church of Pentecost has constructed a 3kilometre (300 metres long) road at Nyamekye, near Darkuman in Accra. The asphalted road network with ancillary drains within the environs of the Church was completed at the cost of GH¢150,000.00. It was commissioned by the Deputy Greater Accra Regional Minister, Honourable Deaconess Elizabeth Sackey, last Friday March 29, 2019. Present to grace the ceremony were the Ablekuma North Municipal Chief Executive (MCE), Hon. Kofi Ofori, the Chief of Odorkor, Nii Armaa III, and the Assemblyman of the area, among others. Hitherto the said road used to be full of potholes which stored lots of water whenever it rained making it virtually impassable. The area also used to experience perennial flooding due to the poor nature of the road. Speaking at the function, the Deputy Regional Minister applauded the Church for taking a bold step in supporting government to provide good roads in the region. She noted that the initiative by the Church has brought hope for the people in the community, and called on other churches and organisations to emulate the good example of The Church of Pentecost so as to facilitate the development of the country. “Road construction remains a strategic sector of the Ghanaian economy. It is the fulcrum and avenue in opening up our communities for effective socio-economic development. However, the performance of this sector has suffered a major budgetary constraint. Therefore, the provision of this facility has indeed brought great relief to government in its quest to provide good road network to the country,” the minister said. Touching on the church-state partnership, Hon. Elizabeth Sackey indicated that the church and government has a huge responsibility to ensure the wellbeing of the citizenry. She, therefore, urged the Church to continue to contribute its quota to national development. The Kaneshie Area Head of the Church, Apostle Mike Etrue, stated that road infrastructural development, road safety, and environmental cleanliness have been a herculean task to government and, therefore, cannot be left to government alone to do. “It is against this need and backdrop that the overarching theme of The Church of Pentecost in the next five years “Possessing the Nations” gave us the impetus to take up this laudable project which was completed under one calendar year. “The Church of Pentecost, therefore, aims at providing accessibility to facilitate mobility and movement of goods and services to our church and the nearby communities,” he stressed. Apostle Etrue pointed out that under the possessing the nations agenda of the Church (Vision 2023), the Church will partner government to provide social amenities such as potable water, take up environmental cleanliness campaign, improve conditions at selected prisons, build police posts, school infrastructure, among others, across the country. He appealed to the beneficiary community to help maintain the road by avoiding acts such as washing of vehicles on the road, draining of vehicular lubricants on the road, as these soluble destroy the materials used in the road construction. The Ablekuma North Municipal Chief Executive, Hon. Kofi Ofori, on his part, was full of praise to the Church for the project. To reciprocate the gesture by the Church, the MCE announced that the Assembly has taken steps to rename the street after the Church. The Odorkor Chief, Nii Armaa III, on behalf of the chiefs and people of the area, lauded the Church for the project. In a related development, a baptistery constructed the Nyamekye District has been dedicated by the Area Head with support from the Deputy Regional Minister. The event coincided with the commissioning of the street project.